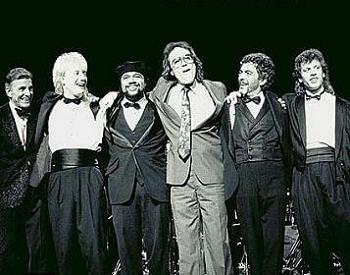 Bellson, Bissonette, Chambers, Colaiuta, Gadd and Weckl, at the "Buddy Rich Memorial Scholarship Concert" in Los Angeles, 1989. 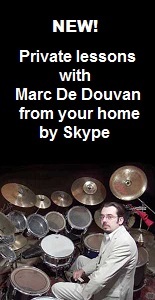 Click on the name of a drummer to see a biography written by myself with critical commentary (attempting to highlight the creative contribution of the drummer in the history of music), video or audio clips (in solo or in a band or even a lesson from him, a presentation of an instrument conceived especially for him or one or several interviews of him), a selective discography, and sometimes even a videography and bibliography, and also external links (to his official website and / or to drummerworld.com, which offers other video and audio clips) and a list of famous musicians or bands, with whom he played. N.B. : Some drummers appear in several categories.